A few years ago, I was doing some background reading on slavery in Kentucky, which was much different than the semi-industrial plantation system of the deep South, in order to better understand (and explain) Mary Beckley Bristow's relationship with her slaves,1 when I came across a reference to an Edward Stone, of Bourbon County. Aha! A synapse fired. That's a familiar name. I checked my Stone files and found that the time and the place fitted with an Edward Stone who was my fifth great uncle. It seems that one Stone brother (Thomas) left Albemarle County, Virginia, for the Cumberland River in Middle Tennessee shortly after 1800. We descend from Thomas. About the same time, several of his brothers (Kinzea, John, James, and Edward) also left the Virginia Piedmont to settle in Bourbon County in the Bluegrass of Kentucky. According to J. Winston Coleman, Jr.'s Slavery Times in Kentucky, Edward Stone was a notorious slave dealer, or "niggah trader" in the early nineteenth century. Now, even in the heart of the South, slave traders were regarded by most people with disgust and loathing, reflecting the uneasy consciences of the slave owners, regardless of how fervently they tried to justify the "peculiar institution" to themselves and to an increasingly hostile world. "I wish to purchase TWENTY NEGROES, BOYS & GIRLS from 10 to 25 years of age. A liberal price will be given for those answering the description on early application to the subscriber. Living on the Limestone Road, 4 miles from Paris leading to Millersburg." In purely economic terms Kentucky had a surplus of slaves, while the deep South had a shortage. Edward Stone made money trying to correct that imbalance. For the next ten years he collected slaves, mostly from the Bluegrass, but some from further afield, buying from individuals or from estate sales, and when he had assembled a large enough number, marching them up to the Ohio River at Maysville to board flatboats bound for Natchez or New Orleans, where most would be put to work in the cotton or indigo fields of the Mississippi Delta. "Having passed through Paris, in Bourbon County, Kentucky, the sound of music, (beyond a little rising of ground) attracted my attention; I looked forward and saw the flag of my country waving. Supposing I was about to meet a military parade, I drove hastily to the side of the road; and, having gained the top of the ascent, I discovered, I suppose, about forty black men, all chained together after the following manner: Each of them was handcuffed, and they were arranged in rank and file. Edward Stone marching his slaves to the Ohio River. "A chain perhaps forty feet long, the size of a fifth-horse chain, was stretched between the two ranks, to which short chains were joined which connected with the handcuffs. Behind them were about thirty women, in double rank, the couples tied hand to hand. A solemn sadness sat on every countenance, and the dismal silence of this march of despair was interrupted only by the sound of two violins; yes, as if to add insult to injury, the foremost couple were furnished with a violin apiece; the second couple were ornamented with cockades, while neat the center waved the republican flag, carried by a hand literally in chains. . . ."
Edward Stone's Last Trip, September 1826. 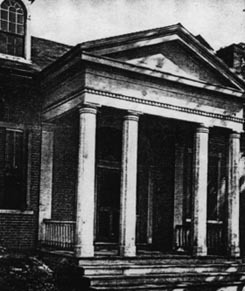 Among the fatalities was Edward's nephew, Howard Stone, a son of his brother Kinzea, along with a David Wood who may have been an inlaw or relative from Albemarle.6 Although neither Edward nor Howard left a will, the Bourbon County Clerk kept very complete records about the settlement of the estates, a process which dragged on for years. The administrator for both estates was Edward's elder brother, Kinzea, who supervised the inventory and sale of the assets. Edward's personal estate, not counting real property, brought in a little less than $30,000, a very respectable amount for the period. Among the buyers at the sale of Edward's possessions (which lasted for three days, the 28th through the 30th of November) were other Stone siblings and inlaws.7 Everything pointed to the fact that Edward Stone, the notorious "niggah trader," was indeed the brother of Thomas Stone of Sumner County, Tennessee. It seems that Edward did not lack more constructive talents. He was also a builder of some accomplishment. His own house, on Limestone (Maysville) Pike, known as The Grange, as well as one he built for a neighbor are still standing after almost two centuries, regarded as fine examples of Kentucky frontier interpretation of the Greek Revival style.8 Perhaps he was inspired to turn his hand to architecture by having grown up near Jefferson's elegant home, Monticello, and the impressive buildings at the University of Virginia. Front entry of The Grange. When I mentioned my discoveries about Edward Stone to Ron Bryant, the KHS librarian, he said that as a boy he got a delicious thrill passing by the home of such a notorious character. 1 See Aunt Polly's Diary for the results of my digging. 2 Originally in Western Citizen, Lexington, July 24, 1816. Quoted in Coleman, Slavery Times in Kentucky (Chapel Hill: University of North Carolina Press, 1940 (Reprint 1970), 144. 3 Originally in Western Luminary, Lexington, October 4, 1826. Quoted in Coleman, 145-146. 5 Coleman, 176, quoting Western Luminary, October 11, 1826. See Kentucky Ancestors 9: 150. "Stephensport Baptist Cemetery." 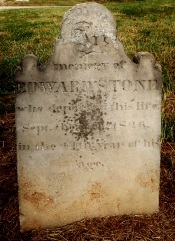 His tombstone inscription reads: "Stone / Edward / aged in 44th year / 17 Sep 1826." 6 Although Coleman (Slavery, 175) gives the name as David Cobb, his source, the Lexington Western Luminary of 27 Sep 1826, identifies him as David Wood. There were several links between the families. Aside from Edward's sister Elizabeth marrying Edward Wood in 1801, John Stone was married to Elizabeth Wood, daughter of William Wood (who gave consent), by Min. Jacob Watts, 2 Jan 1816. See John Vogt & T. William Kethley Jr., Albemarle County Virginia Marriages 1780-1853 (Athens, GA: Iberian Publishing, 1991), 203; 301. 7 Edward's estate first came to the court's attention within two weeks of his death, on 2 Oct 1826, when his brother Kinzea Stone was appointed administrator, posting a bond of $60,000, with six local men acting as sureties: George Northcut, Nathan Goodman, Josiah McDowell, Manson Seamonds, Thomas Crosthwaite, and Louis G Ray. [Bourbon Orders H: 395] The size of the bond required and the number of men acting as sureties reflected the unusual size of the estate. Most of the sureties were Stone inlaws. (See the Bluegrass notes.) Buyers at the sale, 28-30 Nov, included Kinzea Stone, Thomas Crosthwaite & Thomas Crosthwaite Jr, Edward Wood, and James McVicker. Total receipts $28,707.71. Results of the sale were reported 30 Nov 1826 in Bourbon Wills G: 441. An inventory was submitted 4 Dec 1826 with a total of $10,964.59-3/4. [Bourbon Orders H: 425. (See Wills G: 435-438 for details.)] Another $315.81 was reported in Jan 1827 [Bourbon Wills G: 452], and a settlement recorded 3 Sep 1827 [Bourbon Orders H: 494]. In comparison to that of his wealthy uncle, young Howard Stone's estate was pretty small (although not insignificant for the time). The inventory reported 4 Nov 1826, by Robert Champ, John L Hickman, and Jackey S Hitt, totaled $156.75. [Bourbon Wills G: 514] The sale, conducted by his father Kinzea who served as administrator, 30 Dec 1826, yielded somewhat more. $172.25 + $180 cash for a total of $352.25. Purchasers included the widowed Virginia Stone, Kinzea Stone, James McVicker, and Nelson Watts. [Bourbon Wills G: 515] Virginia Goodman, daughter of Nathan and Mildred (Clarson) Goodman, had married Howard Stone, 23 Mar 1825, a year and a half before his fatal trip. [Bourbon Marriages 2: 87] The young widow married Josiah [or Joseph] Watkins five years after Howard's death and they moved to Missouri before the war. 8 Walter E. Langsam and William Gus Johnson, Historic Architecture of Bourbon County (Paris, KY: Historic Paris-Bourbon County, 1985), 97-96. Photographs appear in Rexford Newcomb, Old Kentucky Architecture (New York: Bonanaza Books, 1940), Plates 49, 50. Alas, this fine work is long out of print. 9 See Coleman, 173-174. Kentucky Educational Television has a brief but not too accurate description of Edward Stone and The Grange on KET's Underground Railroad. 10 Marilyn Bauer, "Slave pen now holds history" Cincinnati Equirer Cincinnati.com, 8 Feb 2004. Also Patricia Leigh Brown, "In a Barn, a Piece of Slavery's Hidden Past" Posting by Sarang Shidore, 9 May 2003, from the New York Times. I invite your comments and corrections. Drop me a note. Return to the Stone Family page or to the Green Wolf page for more family history notes. Copyright © 2004, Neil Allen Bristow. All rights reserved. This page updated 4 November 2015.